IAQSource.com > Articles > Have You Considered Garage Ventilation? Have You Considered Garage Ventilation? Attached garages are an obvious source of pollution - from unhealthy odors from cars, garden chemicals and other stored items to deadly carbon monoxide. If your HVAC system is in your garage - and exposed return ductwork is not sealed properly - your heating / AC system may be drawing polluted air into the home - distributing it through your ductwork. If you have HVAC equipment or ducts in your garage - the first step is to make sure that everything is sealed properly. Any combustion heating systems that are not completely sealed need to be supplied with make-up air to ensure safe operation. Even if your heating / AC system is not in the garage - you are probably introducing polluted air from your garage into your home on a daily basis. Consider the common scenario of pulling your car into the garage - then shutting the garage door behind you. When the entry door between the garage and house is open - residual exhaust fumes your car and other nasty pollutants are entering your home. It is anticipated that building codes will stipulate a certain amount of mechanical ventilation be required in every garage. 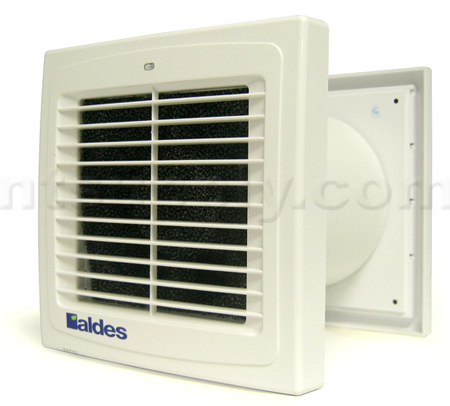 Why not install a ventilation fan that removes hot, polluted air from your garage? 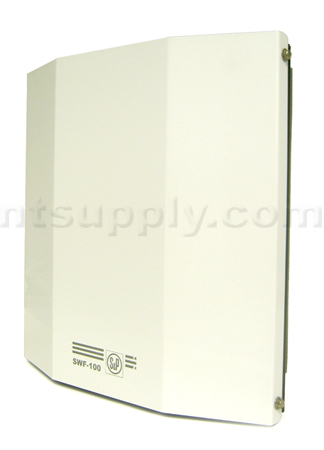 We offer garage fans that will exhaust air straight through an exterior wall. Installation is easy and quick. The average do-it-yourselfer can handle the installation of the fan - but we recommend the wiring be done by a licensced electrician. Really - it's best to run your garage ventilation fan continuously. It's the simplest solution and if you think about it - most of the sources of pollutants in the garage are generally there all the time. The safety provided by continuous operation far outweighs the minimal cost of operation (about $15-20 per year). The idea is to keep attached garages in a slight negative pressure situation all of the time. As for sizing the fan for your garage - we would suggest that you choose a fan rated at 100 CFM. You may have heard of LEED, (which stands for Leadership in Energy and Environmental Design) a third-party certification program and the nationally accepted benchmark for the design, construction and operation of high-performance green buildings. LEED provides a certification system that awards "points" that contribute to obtaining certification under the US Green Building Council's (USGBC) LEED for Homes Rating System. It is possible to earn LEED points by placing an exhaust fan in an attached garage. Credit 10.3: Exhaust Fan in Garage: (1 point) an exhaust fan should be installed to remove air from inside the garage ducted to the outside of the home. The rate for the Garage Ventilator should be 70 cfm if non-ducted (through the wall) or 100 cfm ducted. 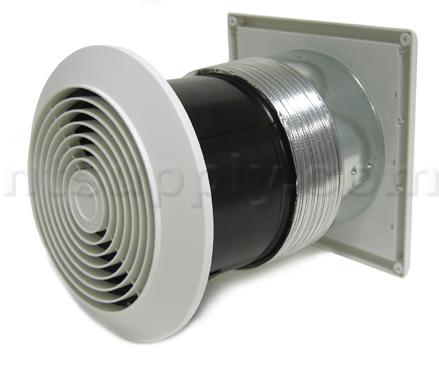 Soler and Palau SWF Sidewall Series Fans - Heavy-duty construction and real power - these fans install with the motor on the outside of the home. A small grille is all that is needed on the inside. Available in duct sizes from 4-6" and CFM ratings from 100-150.